Born in mid-nineteenth century Greece, Papa-Nicholas was married and the father of one child, after which he spent the rest of his life in celibacy. He was ordained deacon in 1879 and priest in 1884, and his entire life passed in the midst of the noisy and bustling city of Athens as though he were living in a cave in the desert; "his mind was a stranger to everything." Ills inner state was of such purity, and the intensity of his spiritual life was so great, that it is not surprising to learn that saints often appeared to him, or that he was clairvoyant and worked countless miracles. In his guilelessness and deep faith Papa-Nicholas regarded these divine gifts and manifestations as being quite natural; if, however, he chanced to relate some vision and saw that his listeners were astounded, he was apt to say, "I didn't see anything; I just make things up," so as to avoid any reputation of being holy. He himself had no idea of his sanctity, "but rather tears for his sins were never absent from his eyes." Papa-Nicholas was a perfect modern example of Ft. Seraphim of Sarov's instruction to "acquire the spirit of peace, and thousands around you will be saved." He shunned all occasions of argument. Once, when two wardens were quarrelling in his presence, he hid under a table--not out of timidity, but as a wise strategist of spiritual warfare. In advising one of his spiritual daughters on how to control her temper, he said, "Do you think, my child, that I don't know how to speak out? I know, but I think of the results, and so I keep quiet." Throughout his life his spirit of peaceful meekness constantly amazed everyone with whom he came in contact. Even when admonishment was called for, Papa Nicholas had no need of many words: his life itself, his very presence served to bring the erring soul to amendment, for he possessed an abundance of the grace of the Holy Spirit. The indwelling of the Holy Spirit caused him to be cheerful even when he met with bitterness or grief. Uneducated by worldly standards, extremely simple both in speech and demeanor, he was often misunderstood and ridiculed; those affected by modernist trends regarded him as something of a fool. But throughout his life he was never slandered-that is, he was never accused falsely. He believed that the reason he had been so protected was because whenever he stepped out of the house he began to pray the following from Psalm 118: "My steps do Thou direct according to Thy saying, and let no in iniquity have dominion over me. Deliver me from the false accusation of men, and I will keep Thy commandments. . ." etc. Many people today, as then, consider this kind of approach to the problems of life to be simplistic, childish, old-fashioned, or even superstitious. It simple, and it is child-like and old fashioned, but it partakes of the simplicity of the Gospel and the divine power that comes to those that consider themselves to be the least among men. As one writing about Papa-Nicholas put it, today "calm and peace have been brushed aside, and spiritual confusion is left with us ." The focus of Father Nicholas' entire life and indeed of all creation was the traditional liturgical cycle of the Orthodox Church, culminating in daily Divine Liturgy--in fifty years he never once missed daily Liturgy, regardless of snowstorms or revolutions, "not even with the invasion of the English and French!" His commemorations would last for hours. Whenever he was given a slip with names, he would save it and commemorate the names daily for several months until one of his helpers 'weeded it out' so as to keep the conscientious priest from being entirely overwhelmed. "His love for prayer did not allow him to take his physical powers into account." One who attended Papa-Nicholas' services remembers: "When he commemorated the saints, he wished, if it were possible, to commemorate every single saint--as many as were found in the Synexarion, each one separately by name. Since much time was consumed, some would begin to cry out to him, 'Papa-Nicholas! say"...and of all Thy saints!" '; but he, without becoming troubled in the least, would continue to the end." So intensely did he enter into the liturgical life of the Church that it can be fairly said that his own individual personality ceased to exist as he took on more and more of the "psychology" of the church services. The spirit of prayer did not leave him even as he went about the bustling streets of the city. Once he was so enrapt in prayer that when an old man invited him to step inside a hut to take shelter from the pouring rain, he confessed that he didn't even notice it was raining, and in fact, the old man saw with astonishment that Father Nicholas' cassock was perfectly dry although he had already been walking some distance in the rain. Such a prayerful union with God inevitably came into conflict with the Enemy of our salvation. But with all the temptations and blandishments of the Evil One Papa-Nicholas always dealt firmly and with great confidence in the Lord. As he told one of his spiritual daughters: "With patience, my child, I overcame all the obstacles which appeared before me,"
Perhaps the most serious of these obstacles was the forced change of the Church Calendar from the old to the new observance. This allowed a demonic spirit of confusion to enter the Greek Church soon after the same spirit had entered the Orthodox Church in Russia through the Revolution, causing both Churches to stumble in one way or another, and admitting to both a craving for modern ideas and innovations which ultimately shattered the harmony of Orthodoxy throughout the world. How did Papa-Nicholas deal with these apocalyptic events and influences? When one of his Readers asked him about the controversial Calendar reform, Papa Nicholas replied, "From conviction, the Old, and from obligation, the New!" In other words, he continued to serve according to the Old Calendar--even when this necessitated serving secretly at night, but he did not leave the New Calendar bishops who had enacted this unlawful change. To the "ecclesiastical politics" of his day he reacted with his characteristic patience, meekness, and with obedience wherever possible without compromising the principles of traditional Orthodoxy. When his secret serving according to the Old Calendar was discovered he was often reprimanded by the higher authorities in the Church. He always appeared when summoned and took his dressing-down without self-justification, disarming his accusers with his childlike simplicity and forthrightness. His intent was to remain true to his conscience; he did not try to build up a following or in any way stir up the faithful over the issue of the Calendar, although he blessed others to follow his example and to work for the formal reinstatement of the Old Calendar. Over and ever he said to everyone, "Whatever has been done uncanonically cannot stand--it will fall." Sadly, the Calendar question was never resolved. The harsh and quite unchristian polemics that have become a hallmark of many in the Greek Old Calendar Movement since then are far removed from the behavior of Papa-Nicholas who is championed as the Movement’s founder. One cannot help but wish that his stirring example of charity had been taken more to heart by those that shared his love for the Traditions of the Church in that otherwise worthy movement. 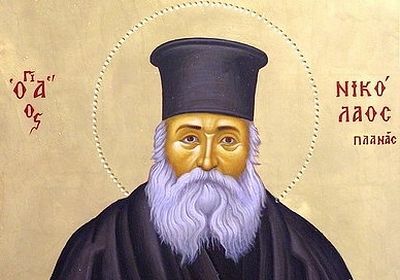 Photios Kontoglou, the great 20th century iconographer of Greek Orthodoxy, himself a lover of the Church's Traditions, wrote that "for Christians there does not exist a more effective teaching than reading the life of a saint--especially that of one who has lived in our own time and Who, by his own life, was manifested as a saint without fanfare." Papa Nicholas has been described as "a living sermon." In his life we find not only a lesson in dealing with some of the unprecedented difficulties facing the Church today, but also a criterion by which we may measure our own behavior as Orthodox Christians, wherever we are, whatever our circumstances, no matter what scandals, temptations, or trials come our way. В тебе, отче, известно спасеся еже по образу: / приим бо крест, последовал еси Христу, / и дея учил еси презирати убо плоть, преходит бо, / прилежати же о души, вещи безсмертней. / Темже и со ангелы срадуется, преподобие Николае, дух твой.